Back in December we mentioned the plans to build a supertall building in Wuhan (Wuhan To Get World’s 3rd Tallest Skyscraper) but had no further information about the design. Now we have confirmation that Chicago-based architecture firm and supertall building experts Adrian Smith + Gordon Gill have won the competition to design the Greenland Center in Wuhan. 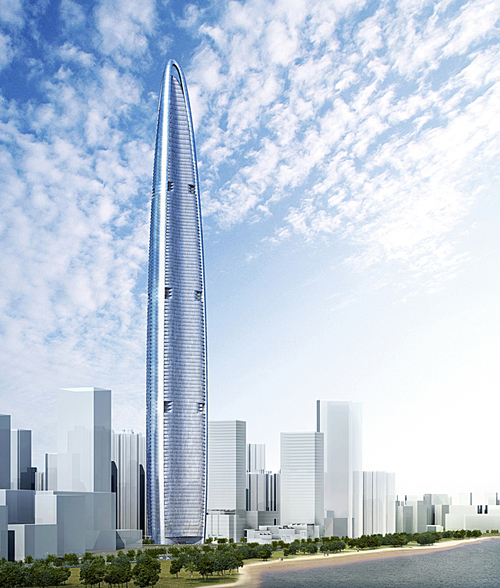 According to the press release, the Greenland Center is set to rise to a height of 606 meters (1,998 feet), making it a the third-tallest building in China and the fourth-tallest in the world. The developer, Greenland Group, previously worked with Adrian Smith and Gordon Gill on another supertall tower in China, the Nanjing Greenland Financial Center. This is an ambitious project for Wuhan, a second-tier city and the capital of China’s central Hubei province. Like other Smith + Gill projects, Wuhan Greenland center seeks to be a paragon of performance and sustainability, with an elegantly tapering form designed to resist wind loads. This is an especially important consideration given for the city was recently hit by torrential rain storms. Bustler has some excellent images of the Smith+Gill design. Here you can see in better detail how the building form, along with the advanced curtain wall, is designed to utilize the best in sustainable practices for the supertall building typology.